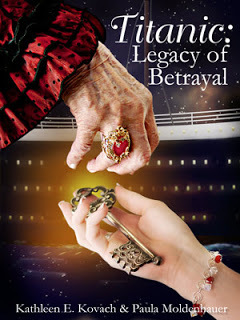 A fascinating blend of history, romance, and mystery, Titanic: Legacy of Betrayal (TLB from here on out) is a historical romance that, surprisingly, held my interest. I should tell y'all that it takes a lot to hold my interest. Because I love mystery, I was delighted that mystery was the spine that held this story together. Why did Thomas Keaton abandon his family? What evil did Charles do from which the Titanic offered him refuge? Will Ember be able to sort out her past and learn what is true so she can give her heart to Jeff? And how can Ember's mother Beverly act like such a wench? I mean, really! Oh, and there's a key on the cover. I LOVE keys. Keys hint of mystery, the unlocking of areas most are barred from entering, secrets, and powerful knowledge. I just can't get enough of keys. Great cover image Kathleen and Paula! It was delightful fun to read this book, and yes, you do spend some time on the Titanic! What I learned from TLB is that it was cold, people got wet, and there were icebergs that brought bad luck. But I don't want to spoil anything for you, so I will refer you to the links below so you can learn more about the story, Titanic history, and order the book. You can buy it either on Kindle or paperback. Kathleen was taciturn about her past, but according to Paula, besides the danger problem, they also got into writing because it pays much better than pilfering money and treasures from a bank vault. I find that hard to believe, but we shall see. Buy the book here on the Amazon Page; Kathleen E. Kovach's links to all the reviews and interviews concerning Titanic: Legacy of Betrayal; Paula Moldenhauer's blog site dedicated to the Titanic and her research. *Y'ALL KNOW I'M KIDDING ABOUT THE HEISTING, RIIIIIIGHT? Thanks for this wonderful review, Denise! Your humor made me giggle!